I centered the crosshairs on the buck’s shoulder and followed him through the head-high Indian grass on the far hillside. 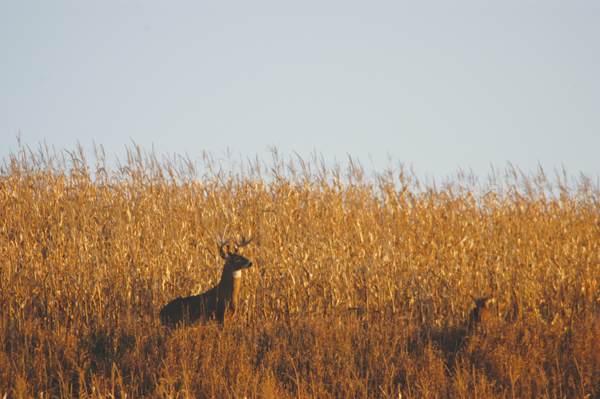 A rapidly setting sun lit the buck up like a golden statue as he stepped out onto a green carpet of winter wheat and then paused, sniffing the breeze for estrous does. At 200 yards, I settled the crosshairs on the kill zone, hesitated—and then set the rifle back down. The buck sported heavy beams with nine long tines and might have scored between 145 and 150, but it was the opening day of Missouri rifle season, and I had reason to believe an even bigger buck would come along. I’d only hesitated because the lucky buck was the largest of the half-dozen I’d glassed that day, all cruising or chasing does across the same 140 acres of overgrown CRP cover. I hadn’t taken a shot, and it had been a great day of deer hunting. Missouri firearm season opens during the rut each fall, and that particular piece of property caught my eye because of the cover and location, surrounded by patches of timber and adjacent farms that I knew would get pounded by other hunters on opening day, driving any deer onto this posted sanctuary. The farmhouse was located 10 miles away, and the owner told me the isolated pocket didn’t get much if any hunting pressure. The lay of the land was such that from a high stand I could view almost all of it, and the first year I spent opening day in that stand, I counted 14 bucks including two Boone & Crockett candidates. The second day, I shot a 175-class buck that I hadn’t seen the first day. Hunting when the bucks are prowling in search of does can be exciting and rewarding. It also can be vexing in the extreme, because there are more unfathomable variables during the rut than at any other time of the season, with “shooter” bucks seemingly appearing out of nowhere and then disappearing just as quickly. I was in the same stand opening day this past season, watching three good bucks mingle with a herd of smaller bucks and does. I knew if I was patient, I would get a shot at a great buck. Yeah, right. I’ve hunted and outfitted other hunters in the Midwestern states for decades now, yet the whitetail rut remains an enigma to me. Potential clients tell me the peak of the rut is the only time they want to book, because it is the best time to tag a trophy buck. I don’t necessarily agree. That the bucks are in breeding mode, actively searching for does and perhaps more visible during daylight, does increase the likelihood of seeing a good buck, but a whole set of uncontrollable and somewhat unfathomable variables can raise hob with your chances of actually getting a shot at that buck. Mature bucks never switch completely out of survival mode. The weather is the first wild card when hunting the rut. From prerut to postrut, weather patterns may change anytime, and this can profoundly impact deer activity. I believe nothing is as detrimental to hunting success during the rut as unseasonably hot weather. Testosterone-loaded, muscled-up bucks do not enjoy hot, dry fall days. 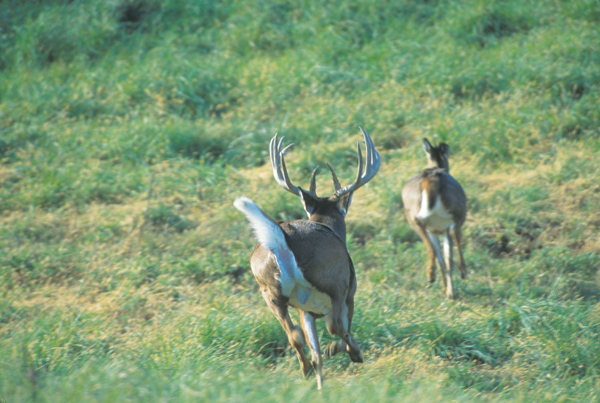 Activity for both bucks and does may be curtailed, regardless of the moon phase or the length of daylight—the supposed keys to triggering rut activity. Unseasonably hot weather can put rutting bucks and does into nocturnal mode faster than anthing else I know. From elevated vantage points, I’ve glassed countless bucks and does that stayed bedded from shortly after daylight until almost dark. The only time they moved was to change position and stay in the shade. Cold, nippy fall days can have the opposite effect. The deer on our Iowa leases may work the food plots well into the morning and then come back early in the afternoon to munch some more corn, beans, turnips and brassicas. But let the afternoon get hot, and this activity falls off to nothing. We get back to hunting hard at first light and again at the end of the day, and such weather definitely calls for other changes in tactics. I’ve taken several rutting bucks in Canada during warm spells by setting up over waterholes. In fact, finding an isolated waterhole on such days is like finding gold. I’ve pinpointed every waterhole, creek and spring seep on our leases, and clients have taken rutting bucks at all of these places, often in the middle of hot days when the bucks left their day beds to slip out for a quick drink. The more hidden the watering spot, the better. But exercise extreme care when approaching and leaving such “hidey-holes” to avoid spooking the deer; don’t even think about hunting tight quarters when the wind isn’t in your favor. Bucks may be doe-crazed during the rut, but they never get suicidal, and their female cohorts are as alert and survival-oriented as ever. Another problem when hunting the rut is the random nature of much of that vaunted deer movement. Yes, the bucks are scent checking as much ground as possible, trying to find “hot” does. They may follow their noses miles at a time. But this also means they wander far from their core areas, and the does being chased don’t follow the same patterns they did prior to the rut, either. Once a buck does hook up with a receptive female, she becomes the center of that buck’s universe—until she goes out of estrus, and then the buck is off and running again. As far as I’m concerned, there are no secrets to finding deer during the rut, no hard and fast rules, other than to spend as much time out there as you can. I do believe calls and rattling horns can greatly improve your odds of getting a shot, by letting you attract and then pull in roaming deer. I was hunting with a partner, an experienced whitetail slayer, during the Michigan rut when we both saw what looked to be a very big buck a half-mile away across an expansive alfalfa field. I blew on my grunt call, but the buck did not respond or react in any way. I kept cranking up the volume until, according to my companion, I sounded like a bad imitation of a 200-pound Canada goose. The buck, a hefty 10-point, stopped his nose-down trotting, looked, and then started loping our way. My companion later told me he’d never heard a deer call blown that loud and was flabbergasted to see the buck respond that way. I told him I’ve always followed the credo nothing ventured, nothing gained. If I don’t see any deer, I typically rattle vigorously every 20 to 30 minutes while on stand and grunt call in between. I try to imitate big bucks to pique the competitive juices of any dominant type that may be cruising through. I’m not bashful about making racket with either the antlers or the grunt tube. Anyone who has heard a mature buck grunt or snort wheeze knows just how much volume they make, and two trophy bucks seriously fighting over a doe make more commotion than a hunter could possibly produce with a set of rattling antlers. If I see deer responding to either rattling or calling, I let their actions and reactions dictate my next move. But, generally, I keep calling or rattling just loud enough and with just enough enthusiasm to keep ’em coming. When a buck hangs up, one of the best tactics I’ve learned to break the impasse is to rake the antlers up and down a tree trunk or on the side of a blind, in the leaves or across a log. This can be done with a minimum of motion and usually piques a buck’s curiosity enough to bring it closer. Like I said, there are no rules when it comes to hunting the rut. But I believe the best advice is to keep on scouting and not sit on a stand day after day with nothing happening. Yes, the deer are moving; you may get lucky, and one may wander by. But I think it makes much more sense to actively try to locate a buck and then try to discern and exploit any slight pattern it might follow. One cool, crisp morning last fall, I situated several clients overlooking well-used food plots while I parked on a nearby ridge where I could glass an expansive harvested cornfield surrounded by timbered slopes. I’d told the hunters I would pick them up at 11 o’clock for a short lunch break and then would take them back out for the afternoon. I glassed some does and fawns feeding in the field, and then a 130-class 8-point cruised the edge just after daylight. But by 8 o’clock, the vast field was empty under a bluebird sky, and I was passing the time with a good paperback, occasionally looking up and glassing the distant field edges. Around 10 o’clock, a doe eased out of the timber, followed a few minutes later by a humongous buck. They stayed in the field for half an hour, and then the doe sauntered back into the woods, leaving the buck to finish feeding. No way should such a deer have been out in the open in bright sunshine at that time of day—but there he was. By 2 o’clock, I had a hunter in a trailer-mounted blind 150 yards from where the buck had finally sauntered back into the timber. At 4 o’clock, the buck returned and resumed feeding out in the field. My client was accompanied by his son, who took the video of a lifetime as the enormous buck slowly fed into range of his dad’s muzzleloader and then got smacked square in the lights by a 250-grain Hornady SST. The big-bodied buck grossed 197 inches and netted 180. Not sure whether perseverance or pure luck played a bigger part in the day’s success; but I feel strongly that continuing to scout is one of the best ways to overcome the randomness of buck movement during the rut—and nothing says you can’t do it while also toting a firearm.